As if winning World of Outlaws Craftsman® Sprint Car Series races and competing for the series championship was not enough of a challenge, Kasey Kahne Racing with Mike Curb’s Brad Sweet is looking towards his second year as the promoter of the Placerville Short Track Outlaw Showdown presented by Riebes Auto Parts. The event, now in its second year at California’s Placerville Speedway, was the brain child of Sweet — who grew up in nearby Grass Valley. For year two, Sweet is adding some star power and a new division. “We’ve got Kyle Larson coming, which he grew up racing at Placerville and everybody obviously knows the success he has had,” Sweet said of the NASCAR star. “It seems like just yesterday he was racing at Placerville with the King of the West Series or the local 360 series. Now he is in the NASCAR Sprint Cup Series. It will be neat to have him come back and race in front of the hometown crowd. He’s going to race a midget and a sprint car. In addition to the USAC midgets and Larson, NASCAR truck series driver and three-time Outlaws winner Rico Abreu will join the field as the feature lap count bumps up to 40 laps and the purse becomes $10,000-to-win. The challenge of promoting was one Sweet said he never really had much interest in. But the challenge of bringing the Outlaws to the track he grew up at swayed him to give it a chance. So Sweet made the event happen last year – it was the first time since 1992 that the Outlaws had been at the track. 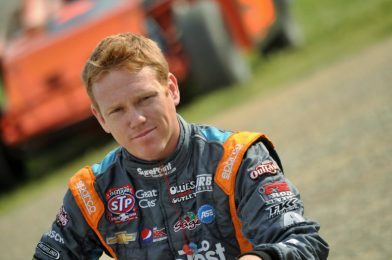 The 30-year-old driver who has been the class of the 2016 season so far, racking up three wins and sitting atop the championship points chase after eight events, said he did not realize how much went into putting on one night of racing. The learning curve was immense but he enjoyed it he said. Enhancing the experience for Sweet was the opportunity to do it with his family and friends, including fiancé Rachel Jacobs. On race day, when the focus shifts from being a promoter to a racer, Sweet said he plans on having everything taken care right to the minute so that when he gets in his No. 49 car, he is not worried about the event happening the way he wants.